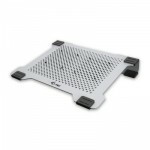 Ergonomic laptop / notebook cooling pad, designed for desk use, features adjustable dual fans to ensure fast and efficient heat dissipation and cooling. This universal cooling pad, compatible with all laptops with up to 15.6â€ screen, helps to improve your working environment and the performance of your notebook. The lightweight 2 mm thick perforated aluminium frame encourages natural airflow, away from your notebook. Both fans can be easily detached and re-positioned to correspond with the position of the vents on your notebook, while the ergonomic design ensures the angle of your notebook is optimised for regular and extended periods of use. The noise generated by the fans is very low; a max. 21 dB, so you will not be disturbed while working. Anti-slip rubber pads on all four corners of the cooling pad make sure that your notebook and the unit itself, are secure. The addition of a single USB hub port on the power cable ensures that the cooling pad does not occupy a precious port on your notebook, at the possible expense of another device. The unit is USB-powered â€“ no additional power supply is required.